With the same imagery and tone as Sleepy Hollow and a hint of The Village’s mystery, Sarah Blakely Cartwright has written a novel based on David Leslie Johnson’s screenplay for the re-imagined fairy tale and major motion picture—Red Riding Hood. The story opens with seven-year-old Valerie and her older sister Lucie returning home with their parents, as it’s “their turn;” their turn, that is, to offer the monthly sacrifice for the wolf, in keeping with the silent pact the village has made with the beast. Unable to accept that her much-loved pet goat, Flora, will die at the hands of a monster, Valerie sneaks out to rescue Flora and instead is stunned into silence as a formidable dark shadow envelopes her and young Valerie finds herself staring into the eyes of the wolf. Though left unharmed, many say that since Valerie saw the wolf—and the wolf saw her—she has never been the same. Jumping to ten years later, as the villagers got together for the annual wheat harvest, Valerie watches as all of her friends giggled and flirted with every male within range; even the sweet and quiet Lucie seems to have eyes for the cute and wealthy Henry, the blacksmith’s son; however, Valerie feels nothing for the local boys; not since her best friend Peter was run out of the village with his father 10 years ago and she hasn’t seen him since—which is all the more reason Valerie is unprepared when a wagon pulls up and deposits the now-grown Peter right in front of her. As her heart hammers in her chest, Valerie tries to make eye contact, but Peter refuses to look at her—both realizing that their childhood bond was just a preamble to their deeper, more mature desires for the other. Sadly, the reunion of Peter and Valerie is to be short-lived as the wolf, apparently tired of their truce, strikes the first blow by taking Lucie’s life. Unaware of the fate of her sister, Valerie steals away to meet Peter in the fields and is shocked by his pronouncement that she has been betrothed to Henry, the blacksmith’s son. Just as the couple agree to run away together, they are frozen in place by the sound of four bells tolling—death by wolf. Valerie’s whole world shatters as she finds the battered body of her beloved sister and must face the reality that she cannot be with the man she has loved her entire life. While Henry promises to make Valerie as happy as he can, Peter wanting her to run away with him, and her mother’s insistence that Henry can make a better life for her, it’s the wolf’s demand that Valerie may have to heed: Go with him, or he’ll kill everyone she loves. Yet, there’s also the bigger question: Who is the wolf? 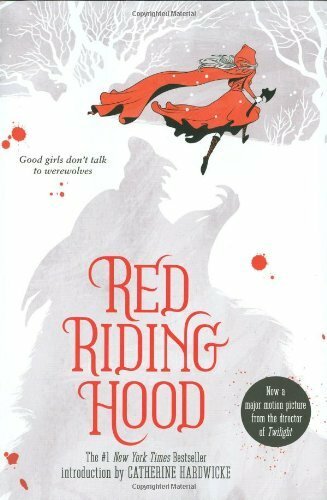 Written as a YA, Red Riding Hood is fairly accessible as an adult crossover as well. Despite its “period piece” tone and setting, the voice is modern and engaging, yet still maintains the integrity of the original—although the author’s effort at working in the classic lines are applauded, they come off as a bit forced and out of context. Ms. Cartwright does a good job of weaving the reader through the twists and turns of this childhood favorite, casting out a red herring here and a shiny distraction there to throw you off track and keep the mystery going. The characters are fairly well-developed and endowed with a healthy sense of villager-it is: the disease that seems to overtake the people you’ve known all your life, making them turn on you in a split second, after you’ve been accused of something outrageous—and usually by someone trying to save themselves. It’s probably also important to note that, similar to Gertrude Stein’s declaration, “there is no there, there” when trying to find her childhood house that no longer existed, for Red Riding Hood there is no ending at the end. To coincide with the release of the feature film, the final chapter will appear on the website www.redridinghoodbook.com on March 14, 2011, at 9 o’clock A.M. Eastern time. Until then, we can only speculate on whether or not Little Red Riding Hood will live happily ever after.